Local Maori people knew of the caves existence, but the subterranean caverns had never been extensively explored until Fred and Tane went to investigate. They built a raft of flax stems and with candles as their only lighting, floated into the cave where the stream goes underground. 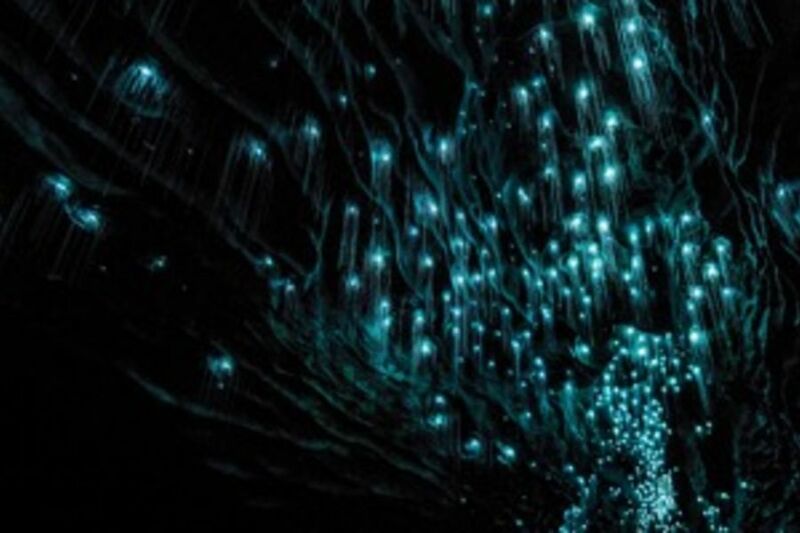 As they entered the caves, their first discovery was the Glowworm Grotto with its myriad of tiny bright lights dotting the cave ceiling. As their eyes adjusted to the darkness, they saw a multitude of lights reflecting off the water. Looking up, they discovered that the ceilings were dotted with the lights of thousands of glowworms. Debris and logs littered the waterway, but by poling themselves toward the embankment they were able to leave the raft and explore the lower levels of the cave. Here they found themselves surrounded by the glorious cave decorations. By 1889 Tane Tinorau had opened the cave to tourists. Visitor numbers soared and Chief Tane and his wife Huti escorted groups through the cave for a small fee. In 1906 the administration of the cave was taken over by the government. In 1989, almost 100 years later, the land and the cave were returned to the descendants of the original owners. Many staff employed at the caves today are direct descendants of Chief Tane Tinorau and his wife Huti.